Designed and assembled in the USA to blend safety with comfort, the Kohler Walk-In Bath comes with a variety of features to help consumers with different levels of mobility feel secure and pampered while bathing. Kohler Co.’s guiding mission is to combine industry-leading design with technology to enhance consumers’ sense of “gracious living” through products that reflect high quality, charm and good taste. A Kohler walk-in tub is designed for your specifications and comes with a Walk-in Bath Price Promise after a 35-point in-home assessment. Your Kohler tub can be designed with your choice of safety and comfort features. The Centers for Disease Control and Prevention reports 68 percent of injuries in bathrooms take place while the injured person was bathing or getting in or out of the bathtub or shower. Kohler’s Walk-in tub offers convenient and safe bathing to consumers wanting to age in place or who have limited mobility. 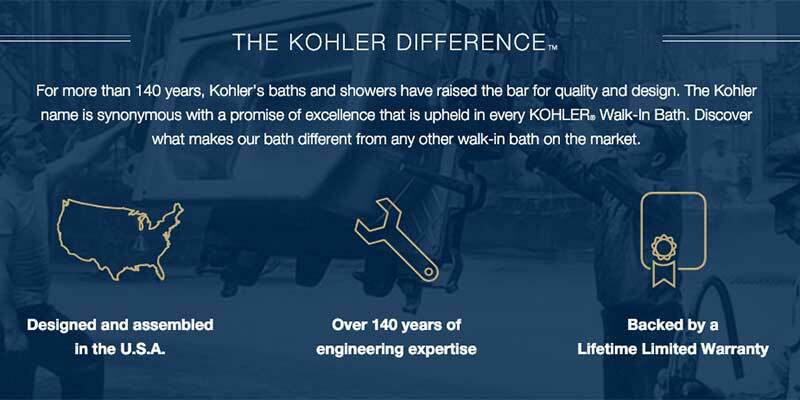 Founded in 1873, the Kohler Co. evolved into a global manufacturing business. Producing a variety of goods such as engines, home interior products to name a few, Kohler is best known for its wide range of kitchen and bath products. Kohler Co. ranks #51 on Forbes’ 2018 list of America’s largest private companies and won many awards through the years for innovation, design and environmental awareness. Kohler’s Walk-in Bath – its walk-in tub model– comes in a variety of colors, textures and safety features. The tub can be customized with specialty options such as a selection of bath walls and faucet finishes making these walk-in tubs attractive in the bathroom. Low three-inch high threshold is the lowest available among walk-in bathtubs. Two handrails located inside the tub and on the outside rim allow bathers to steady themselves while getting in and out of the bath. Extra-wide door with an easy-to-turn handle. Ergonomic Control panel control panel easily operates jets and heated surfaces with the touch of a button. While safety is most important, Kohler Walk-In Baths offer comfort features for a relaxing bathing experience to soothe aching joints and wake up tired muscles. Hydrotherapy whirlpool jets massage back, legs, and feet while air jets create tiny energizing bubbles. Adjustable heated surfaces for the neck and back with a heated extra-wide seat for comfort while filling and draining the tub. Retractable hand shower with an ergonomic design and multiple water flow and temperature settings. Kohler bath products are known for having a variety of designs, and the Walk-In Bath is no exception. From a classic, traditional look to a more contemporary and modern style, the KOHLER® Walk-In Bath offers several design options. Kohler gives you a choice of eleven color and pattern combinations for the LuxStone bath walls and two metal finishes for the faucet, in addition to a crisp white or a creamy biscuit shade for the tub. LuxStone is made of natural marble and durable fibers to create a surface that is stronger, more durable and won’t chip, fade or discolor like fiberglass can. Only Kohler offers LuxStone walls. Kohler offers a video gallery on the website so you can see features in action. Take the innovative Interactive Tub Experience for a spin on the site, where you can create and view a 3D representation of your Kohler Walk-In Bath. Given the customer has many options for customizing the Kohler Walk-In Bath, the company provides no general cost information over the phone or on the website. To get pricing, submit an online quote request on the company site to schedule a free in-home appointment. Kohler offers a variety of financing choices like monthly payment plans and runs money-saving promotions from time to time. At the in-home quote appointment, a Kohler representative discusses your needs and tub features and completes a 35-point checklist taking into account your plumbing, electrical and bathroom layout. The no-surprises quote is the price you pay for the tub, any optional upgrades, installation, delivery, removal and disposal of the existing bathtub, and the warranty. Kohler’s Price Promise makes the quote valid for one year from the day you get the estimate. Kohler offers a lifetime limited warranty on the Walk-In Tub, which is installed by a Kohler-certified installation specialist. The warranty guarantees your KOHLER® Walk-In Bath will be free of manufacturing defects for as long as you own your home. In the event a manufacturing defect does occur with any KOHLER® Walk-In Bath component, the repair and replacement are free of charge. This warranty stands out as it includes the pumps, motors, jets, bath door seal and the hand shower. ConsumersAdvocate ranked the KOHLER® Walk-In Bath first among all walk-in bathtubs, with an overall consumer rating of 9.9 out of 10. Top10Reviews notes Kohler Walk-In Baths are among the highest quality walk-in tubs you can buy. The Kohler Co. receives an “A+” rating from the Better Business Bureau, indicating the company gets top scores in each of seven business quality categories. You will find a number of positive testimonials in both print and video formats on Kohler’s Walk-In Bath website. Consumers particularly noted the safety and comfort features, attractive design, ease and speed of installation, and the confidence of purchasing a trusted brand. We found very few complaints about Kohler’s Walk-in Bath but a couple mentioned having trouble getting their walk-in tub repaired. Does Medicare or health insurance cover a Kohler Walk-In Bath? Medicare and health insurance does not typically cover the cost of a walk-in tub, however, talk to your insurance company if your doctor says a walk-in bath is medically necessary. If you carry Medicare supplement insurance, check to see if you have coverage for part of the cost of a walk-in tub. There are other options for paying for a walk-in tub, including Medicaid if you qualify. How long does a KOHLER® Walk-In Bath take to fill up and drain? Kohler Walk-In Baths come equipped with fast-drain technology, so the tub fills and drains within minutes. The time required to drain or add water depends on your home plumbing system. How do I stay warm while the KOHLER® Walk-In Bath fills up and drains? Kohler Walk-In Baths utilize heated surfaces to keep the bather warm while waiting for the tub to fill or drain. How many jets does the KOHLER® Walk-In Bath come with? The KOHLER® Walk-In Bath has ten adjustable hydrotherapy jets, six directed at the back and spine, two in front of the legs, and two behind the calves. Seventeen adjustable BubbleMassage air jets create thousands of tiny bubbles in the water to simulate a spa-like experience. Do I need to hire a plumber to install a Kohler Walk-In Bath? The cost of a KOHLER® Walk-In Bath includes everything upfront, with installation, so there’s no need to hire a plumber. Installation is completed by a highly-trained Kohler-certified specialist, usually within one day. Can I get questions answered about the KOHLER® Walk-In Bath before scheduling an in-home appointment? Kohler representatives are happy to answer your questions any time. Call the number listed on the website or use the online chat to get answers. As retirees choose to live in their homes longer than before, bathroom fall injuries become more common. Several ways to prevent falling in the bathroom exist and the safety features of a KOHLER® Walk-In Bath can help you maintain independence while the tub looks attractive in your home. Creating the walk-in bath of your dreams using Kohler’s online 3D design feature is very useful, and it’s easy to schedule an in-home appointment to receive a quote that’s good for a year. The assembled-in-the-USA KOHLER® Walk-In Bath provides peace of mind with a safe and soothing bathing experience for years to come, from a highly trusted brand in business for 140 years. We had a new shower, walk-in tub, toilet and floor installed. Five months and 3 days from start to finish before we could use the Kohler shower for the 1st time. The existing toilet, shower and tub was removed for 3 months. We could not shower in the master bathroom from August until after New Year. It took over 3 months before we could use the walk-in tub and no use of the previous tub, which had been removed. The workmanship by Bob and his son, also named Bob, was well done. Bob conferred with us in every decision that had options. Both were personable and respectful and their work was skilled and neat. But come on! It was supposed to be no more than 5-8 days. Neither the Kohler shower head nor the handheld shower is as good as what we had. No municipal permit mentioned in the contract and none was applied for, even though there was a 6-week interval between signing the contract and the initial date to begin construction. Due to the plumbing and electrical work it should have been obvious to the salesman to include this. Without the permits the Township said it could have become a problem on resale of the home. HomeSmart was in no rush to complete. We received apologies from the owners after the fact. Worst experience. There has been no resolution after 2 1/2 more months 3/20/19. Hi Marvin, we sincerely apologize for the delay in service and installation for your Walk-In Bath and shower. We take these matters very seriously, and have contacted the Kohler Partner that was involved in your installation. Thank you for bringing this to our attention.